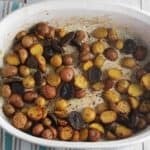 Spanish roasted potatoes are an easy side dish flavored with paprika and garlic. With a large spoon, toss the potatoes with the olive oil. Sprinkle the paprika, rosemary, garlic and salt over the potatoes. Toss to combine. Place the potatoes in the oven. Remove the potatoes to stir after 10 minutes and 25 minutes of roasting. Roast for a total of 40 to 45 minutes. When done the potatoes should begin to get a bit crispy on the outside and easily pierced with a fork. Enjoy as a side with beef and other meat dishes. Use fingerling potatoes or other small potato varieties. We like to use a bag of multicolored potatoes for a nice presentation. Adjust seasonings to taste. The quantities given result in a fairly mild paprika and garlic flavor.